MADRID  A Spanish bullfighter is likely to suffer facial paralysis and lose the sight in one eye after a terrifying goring, the hospital treating him said Saturday. Television images showed the moment when the bull's left horn ripped into Juan Jose Padilla's lower jaw to emerge beside his protruding eyeball as spectators in the northeastern city of Zaragoza screamed in horror. Padilla is in a stable condition and recovering from a five-hour operation to repair his face, the statement from the Miguel Servet Hospital said. 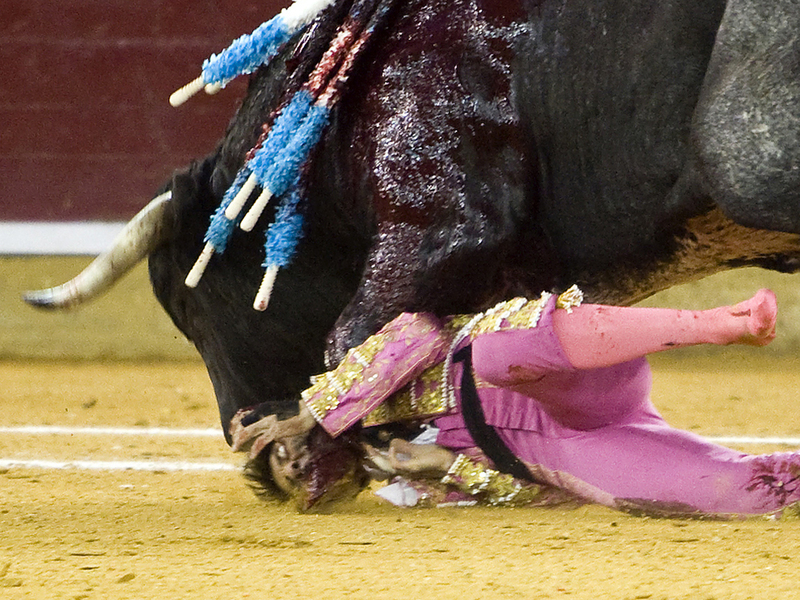 It said Padilla, 39, suffered eye, bone, muscle and skin damage when the bull pinned him to the ground and gored him. Surgeons had not been able to repair a severed facial nerve. Can Spanish Bullfighting Survive Bans, Economy? TV footage also showed Padilla getting up from the ring, his face gushing blood, as the bull was distracted by bullring assistants. "I can't see, I can't see anything," the matador shouted as he was rushed to emergency facilities at Zaragoza's Misericordia bullring before being driven to the hospital. The bull, named Marques, weighed 1,120 pounds and was the second fighting beast Padilla had faced late Friday, during the second day of the annual Virgen del Pilar festivities in Zaragoza. Surgeons used titanium plates and mesh to reconstruct parts of Padilla's facial bone structure and eye socket, doctors Simon Sanz and Nadal Cristobal said in a very detailed, signed statement. Padilla was lucky the horn did not penetrate his brain, said Vicente Yesteras, one of Padilla's retinue of bullring helpers.